Since it’s launch in April, the Amazon Fire TV and Amazon Fire TV Stick has quickly become the best-selling streaming media box on Amazon. With this, app developers have an exciting set of new customers to reach using your Android games running directly on the TV. To transition a tablet or phone app to Amazon Fire TV, it’s most critical to support the TV remote and/or Game Controller. 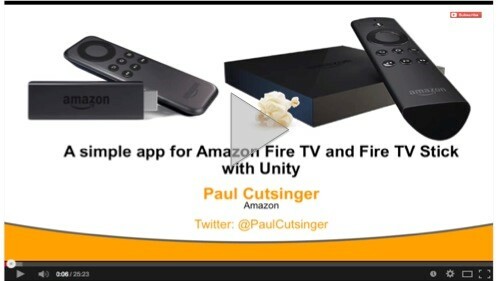 In this video blog post, we’ll build an app from scratch for Fire TV using Unity. 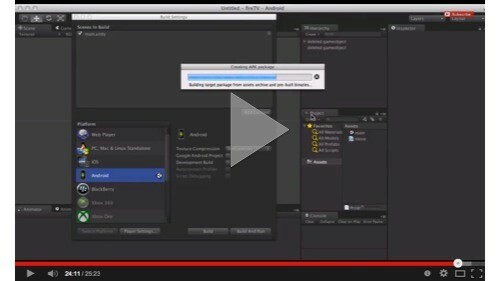 You’ll see how to get a game object reacting to events from the TV remote and Game Controller and you’ll see how to test your app on the Fire TV or Fire TV Stick. You can also learn more about building Fire TV support into your app on the blog. Add the game object that we’ll control with the controller. In this segment we create the script that will receive TV remote and the Game Controller events and cause the Game Object to move with the D-Pad or joystick. We use the Unity Input Manager and the default horizontal and vertical inputs so that both keyboard and controllers work. 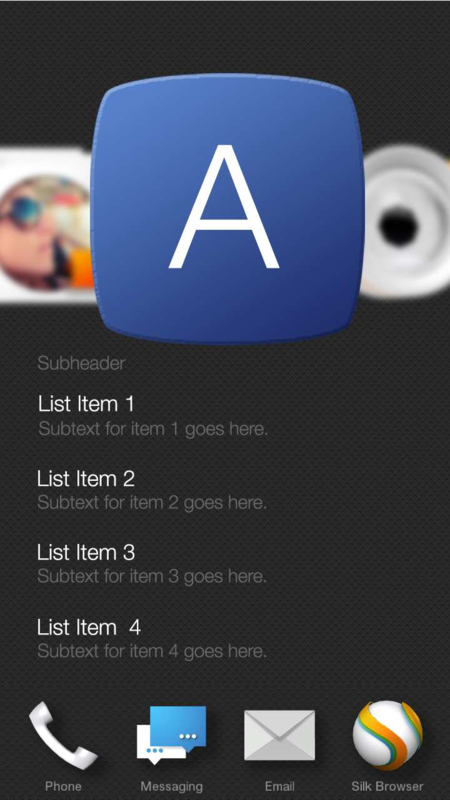 Next we add support for Back, Menu and the A buttons. 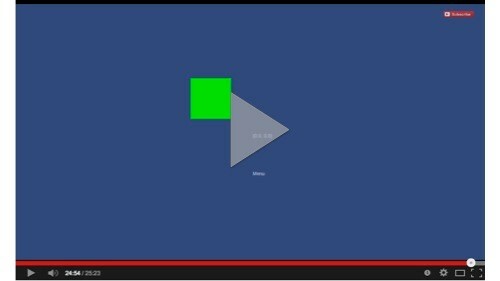 This illustrates how you’d pause, show a menu, and perform game actions like jump or shoot. Now you need to build the app from Unity and run it on device using Android Debug Bridge (ADB). In this segment, we’ll go through that step by step. If you don’t yet have ADB, here’s a post to help you set up ADB. More importantly, you’ll be able to see how easy it is to respond to controller events in your app. Now, how will you to integrate controller support into your game play and UX? With that in mind, I’d like to highlight a set of blog posts that help you answer that question by giving you specific answers for your specific app in minutes. All you need is your APK. Drag and drop it into the tool’s website. We’ll run a test pass and in minutes you’ll get a report including specific action items (if any), links to the documentation you need for each action item and screenshots of your app on device. I’ve sideload apps with many developers and each time it’s really cool to see them light up when their app fires up. There’s a whole new set of Amazon Appstore customers available and it’s so close. 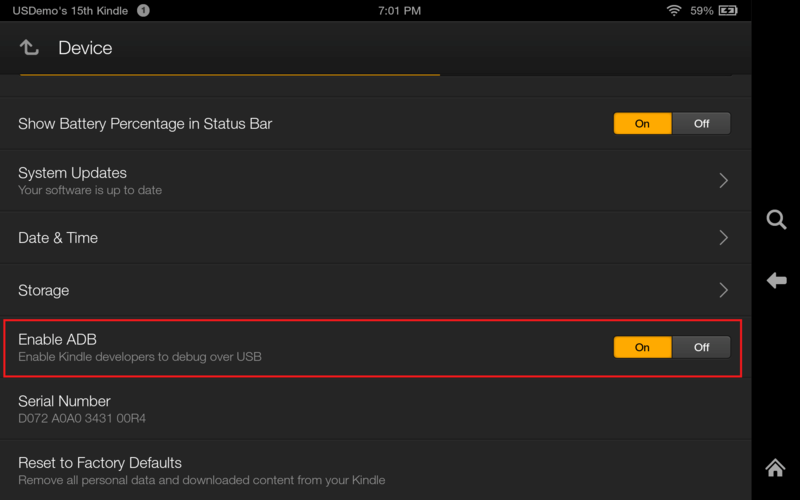 Here’s how you can enable ADB and sideload on each of the Amazon devices and see your app running for yourself. 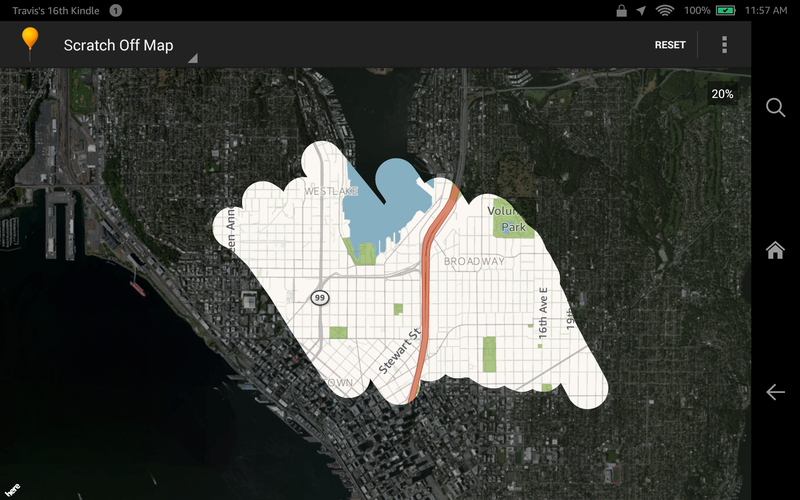 When we launched the Amazon Maps API in November 2012, we wanted to enable you to quickly and easily add mapping functionality to your Fire apps. 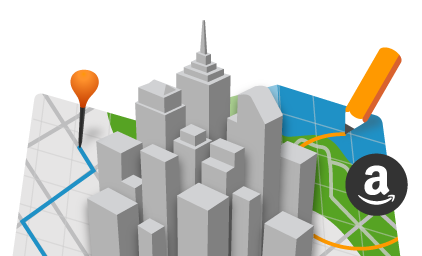 With today’s release of the Amazon Maps API v2, we build on that functionality to offer an even richer mapping experience featuring fast and fluid 3D vector maps, including 3D landmarks, for your Fire tablet and Fire phone apps. 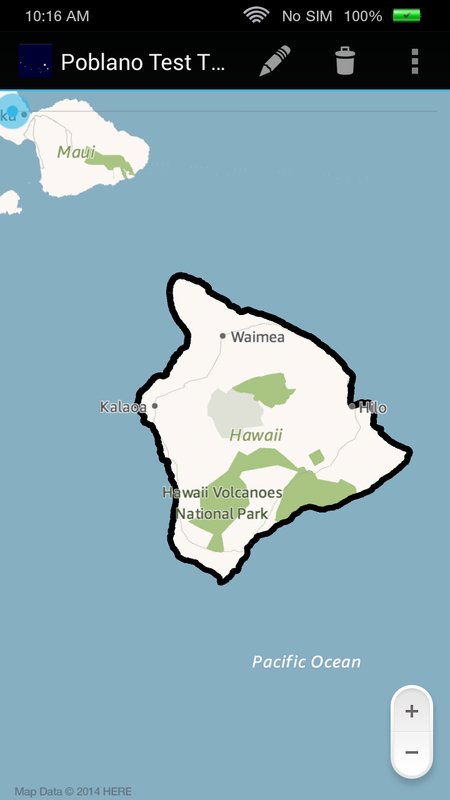 The Amazon Maps API v2 also supports drawing API’s (circles, polylines, and polygons), fragments, multiple maps, and more, enabling you to deliver a customized mapping experience to your end users. There is no better time for Android developers to reach the growing Fire device customer segment with their existing Android app, or an entirely new app. Remove your project's existing dependency on the Google Play services library. The Amazon Maps API v2 is compatible with Fire OS 4.5.1 and higher which is available on 3rd and 4th generation Fire tablets and Fire phone. Test and submit your app to the Amazon Appstore. Each November, Amazon holds the re:Invent developer conference and this year there were several sessions designed for mobile developers. The slides and videos are now live so if you weren’t able to make it to the conference you can still get the content right here. 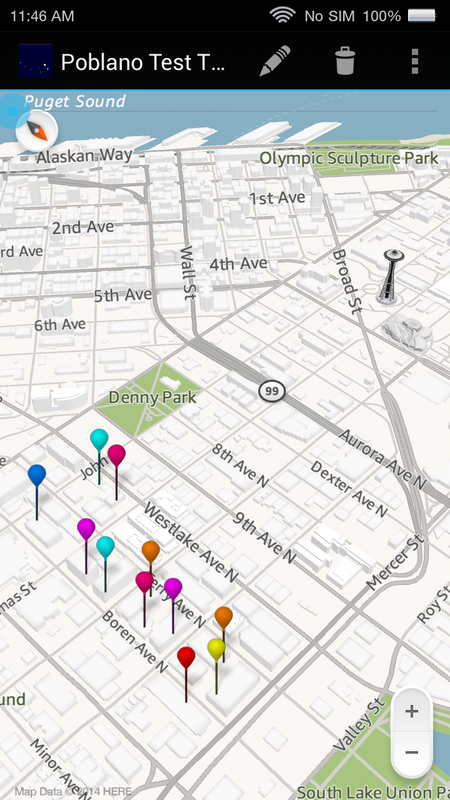 Fire Phone: The Dynamic Perspective API Under the Hood. There were also tracks focused on AWS services for mobile developers and games. 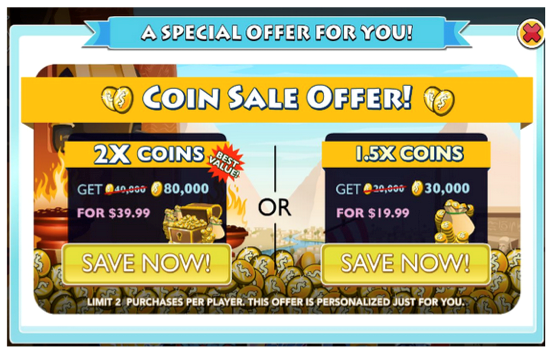 Appstore Developer Select: Optimize your apps for Fire phone and get enhanced merchandising and 500,000 Amazon Coins incentives for your customers. Get the details here. 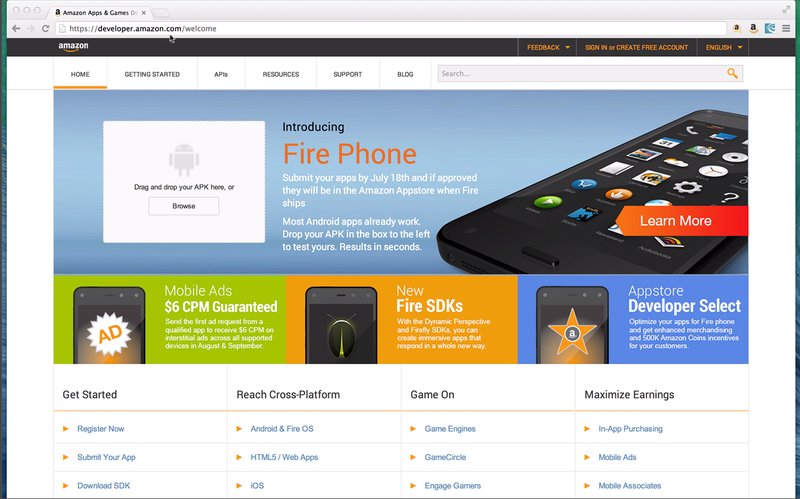 Amazon App Testing Service: Most Android apps just work on Fire mobile devices. Test your app's compatibility in 90 seconds by dragging and dropping your Android APK into our testing tool. Sign up for a free developer account to test your app's look and feel on devices and get the results within 6 hours. Test your app now. 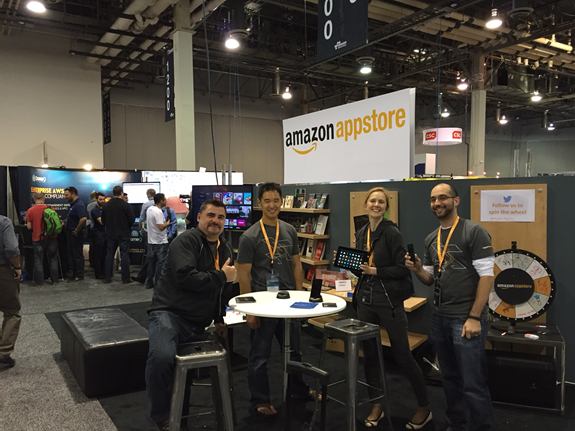 Thursday was our second full day at re:Invent 2014. It was great to talk about apps with so many developers – there are a lot of great ideas out there! We held two sessions focused on Fire phone. @theDaveDev walked through the new customer experience, all the new capabilities for developers, and how to test and submit Android apps . @PeterDotGames spoke about Fire phone’s Dynamic Perspective and how developers can make use of real time head-tracking and 3D effects. Between these sessions, the monetization & Fire TV sessions on Wed and the hack-a-thon on Tues, it was an exciting and full event. Beyond that, the AWS (Amazon Web Services) team also announced a lot of new capabilities and services – here’s the AWS recap. Once again, thanks to everyone that came by the booth to say hi. Player engagement is the key to success for most mobile games, and Amazon GameCircle is designed to help developers increase engagement through player Achievements, Leaderboards, and saved game syncing across multiple devices. Game developers using the Corona Labs SDK can now integrate GameCircle into their Android games using the Corona plugin. The Corona SDK enables developers to build mobile apps and games for multiple platforms including Amazon Fire, Android, and iOS devices. Developers program in Lua and call the Corona SDK, which is built on a C++/OpenGL platform to optimize for graphic applications. Corona's GameCircle plugin implements nearly all of the GameCircle APIs, including submitting the local player's scores & achievement progress, displaying GameCircle overlays, getting achievement and leaderboard data and using Whispersync for Games to synchronize game progress across multiple devices. GameCircle Friends data is available through filtered leaderboards. Hi everyone, we’re gearing up for AWS re:Invent, which is happening at the Venetian in Las Vegas from Nov 11-14. And we’re getting pretty excited about the sessions that are designed specifically for mobile developers. "Fire phone's Dynamic Perspective adds a whole new dimension to UI and customer interaction, combining dedicated hardware and advanced algorithms to enable real-time head-tracking and 3D effects. This session goes behind the scenes with the Dynamic Perspective team, diving into the unique technical challenges they faced during development. Afterward, we explore the Dynamic Perspective SDK together so you leave the session knowing how to add innovative features like Peek, Tilt, 3D controls, and Parallax to your own apps." Usually, it’s not fun to watch while people test out their code demos, but this one is pretty interactive! Between mobile focused tracks, hack-a-thons and some exciting start-up events, there’s a lot to be part of this year. It started with a 90 second test to see if your Android app is ready to launch in the Amazon Appstore. Then there was added support for Fire phone and screenshots from the actual device. Now, you can get the results from your device testing even if you don’t have a developer account. So, grab your APK and get test results in 90 seconds. Test your apps for Fire Tablets, Fire Phone and Appstore for Android in just a few minutes. 75% of existing apps and games we've tested require no changes before going live. You can find out whether your app has any of the common issues that can block publication on the Amazon Appstore. Our App Testing Service also gives you access to additional test results that show you how your app looks and performs on live devices. Start the test here. This morning, I was talking with Mike Hines (@MikeFHines) about his talk: “What the Top 50 Games Do with In-App Purchasing That the Rest of Us Don’t”. It’s going to to be a fascinating, informative and actionable discussion. 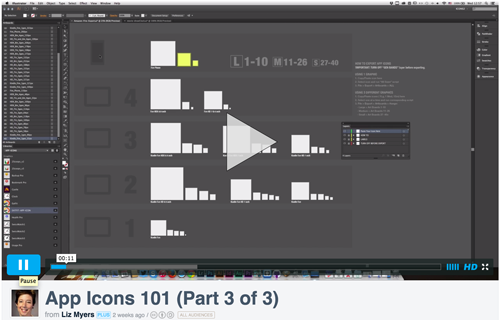 He’s been studying the most effective practices of the top apps and he has a lot of data and design tips to share. For example, have you ever wondered if running a limited time promotion would pirate future sales? Salim Mitha, EVP of Monetization and Marketing at Playtika & Ceasers interactive, did. He's done the analysis in their apps and will talk about the results during this session. This is an advanced level session so be ready to go deep. You’ll want to take notes for your producers, BI team, developers, designers and marketers. To learn more about AWS re:Invent 2014, check out the event website to learn what all the fuss is about. Ready to register? Click here to join us at re:Invent 2014, November 11-14 at The Venetian in Las Vegas, Nevada. AWS re:Invent is sold out! This is going to be the biggest AWS re:Invent yet. This year’s conference will feature three tracks of content to help mobile app and game developers build apps, engage customers and monetize more effectively. In 2013, five start-ups launched at re:Invent in a session emceed by Amazon CTO Werner Vogels, and we’re doing it again this year. If you’re in stealth mode, you can use re:Invent to launch your AWS-powered mobile app or game to the world. If you’re already launched, you can announce a new major feature on stage with Amazon CTO Wener Vogels. The application deadline is 5:00pm PST on September 30th – apply today. AWS re:Invent is a learning conference with breakout sessions covering a broad range of topics and technical depth. All sessions will be delivered by subject matter experts, engineers, or expert customers who can share their real world experiences and lessons learned. Want to get a taste of what to expect? Check out the 2013 re:Invent recap featuring sessions on mobile game architectures, and coding tips to help you distribute your HTML 5 apps on mobile devices. Come learn from customers and Amazon experts how to create Fire phone, Fire TV and Kindle Fire apps. We’ll go into depth on how to create applications that react to customer actions with Fire phone’s Dynamic Perspective and Firefly technologies. You’ll also hear how to reach new audiences with Fire TV. Top mobile developers will share their tips on monetizing and you’ll get behind-the-scenes details from the Amazon engineers who build our technologies. You can see a full list of tracks here. In this track, you’ll learn how AWS services can enable you to scale your game from 1,000 to 1,000,000 players. We will cover common features such as leaderboards, game analytics, asynchronous gameplay, online multiplayer servers, multi-region deployments, and cloud streaming. Game companies using AWS to power their games will share best practices. Click here to see the full list of tracks. Whether you are a mobile developer, a connected device solution builder, or a business trying to be “Mobile-first”, AWS can help you to build fast and scale more easily. The Mobile & Connnected Devices track will give you a detailed look at services like our cross platform mobile push notification and Amazon Mobile Analytics and improve customer experience across platform. We’ll have examples from companies that have already used AWS to power their mobile apps to share their lessons learned. Click here to see the full list of tracks. Start your AWS re:Invent experience early. On Tuesday November 11 from 8:00am until midnight, join developers, AWS engineers and Amazon mobile app experts to hack on big problems in support of a worthy cause. Bring your team, we’ll provide everything you need to get started. Space is limited – only 200 hackers allowed – so register today to reserve your spot. We’re doing this 24 hours before the first keynote, so don’t worry – you won’t miss anything! Click here to learn more. Join AWS re:Invent from the comfort of your home or office. We are live streaming our keynotes and selected breakout sessions on November 12 and 13. Watch the keynotes and hear the latest announcements from AWS executives and key customers. In house testing with side-loaded apps is great for isolating and fixing bugs, but it’s not enough. To be certain that your customers are getting the experience you want them to have, you have to test your app against a production environment. We’re excited to announce a new tool for mobile developers called Live App Testing. Live App Testing allows you to quickly distribute your apps in the Amazon Appstore to a pre-defined set of testers before you go live. The testers will be able to sample the full suite of Amazon services - including in-app purchasing - against our production environment, so you can ensure your app is working as expected. This allows you to gather feedback, improve quality, increase stability and optimize the experience before you push your app live for all customers to download. 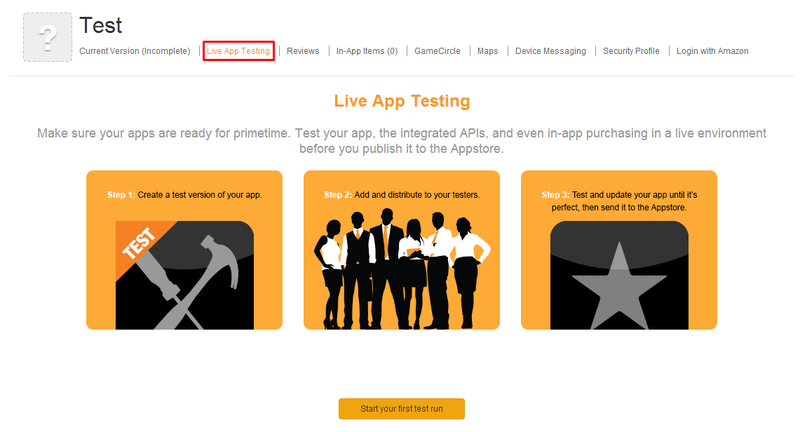 Live App Testing allows you to create a version of your app that is only distributed to select testers of your choice. You invite testers by adding their email address to Live App Testing. 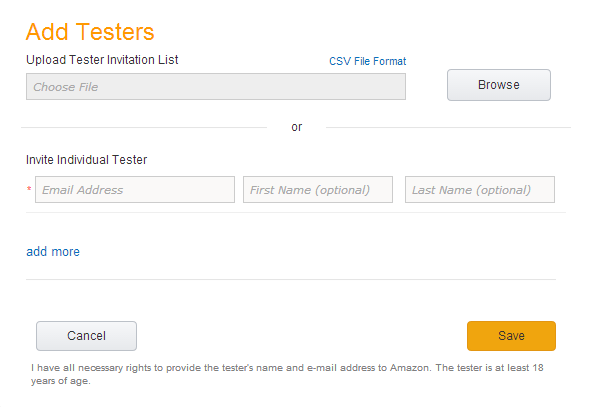 Once testers are invited to test, they will receive an email with instructions to download the test app and begin testing against Amazon’s production environment. Only invited testers will be allowed to download and test your app. As a part of Live App Testing, you can test your apps on any Android or Amazon Fire device. What does Live App Testing Include? Test your app against Amazon production environment before distributing to everyone: You no longer need to wait until after your app is launched to get real world testing. You can now distribute your app to a set of testers you define, which gives your more control over the test. And, you can quickly test against a production environment (yours and Amazon’s), ensuring a higher quality app when you release to the general public. Tester Management: Easily define the list of testers you want to be able to test your app. You don’t need to keep track of who you have invited to test your app. Amazon takes care of the complexity of ensuring that only the set of testers you defined are the ones that are testing the app. Test on all Android and Amazon devices, including Fire TV and Fire phone: You can choose to test your app against all Android and Amazon devices, including the Fire TV and Fire phone. 1. Go to the Amazon Developer Portal and select “My apps”. You’ll need to sign into your developer account. If you don’t have one yet, the sign up is easy and it’s completely free. 2. Select an existing app or click on “Add a New App”. If “Add a New App” is selected, go to step 3, otherwise, skip to step 4. 3. After selecting “Add a New App”, select “Android”. Click next and fill out the New App Submission information. 4. Select Live App Testing to begin to setup a test for this app. Once on this page, click on “start your first test run” to begin the process of setting up your first test. In this step, you will be adding the metadata and the APK that you want to test. 6. Once you have filled out each tab, you can either submit your app (without assigning testers) or go to the dashboard and add testers. If you are not ready to add testers at this time, you can select “Submit” and submit the app for publishing. This process can take up to a few hours. If you would like to add testers before submitting your app, select “Go to Dashboard” to add testers following the steps below. 7. 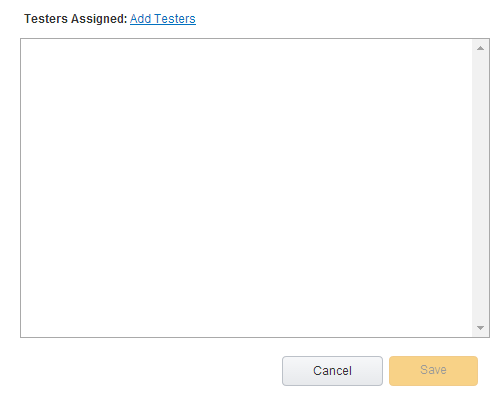 On the dashboard, click on “Add Testers” to add testers to the test. 8. On the testers page, click on “Add Testers”. 9. Either upload a list of tester email addresses or add the testers individually. I recommend you add yourself as a tester so you can get the invitation email which will signify that the binary is available to download and test. 10. Once you add the testers, select save. 11. You will notice on the dashboard that you have 1 tester assigned to the test. At this time, select actions (the sprocket icon) and select submit. You’re all done. Testers will receive an email to join your test once the app is live. Once your app is running, you can either end your test, or promote your test to an upcoming version. By promoting your app to an upcoming version, you can make some finishing touches such as upload final screenshots or metadata before going live. Tests that you have ended will appear on the Live App Testing Dashboard under the “Past Tests” section. You can also easily see the crashes that have occurred during this test in the Live App testing Dashboard. The new Amazon Live App Testing helps you manage testing to help you publish higher quality apps in the Appstore with fewer errors. 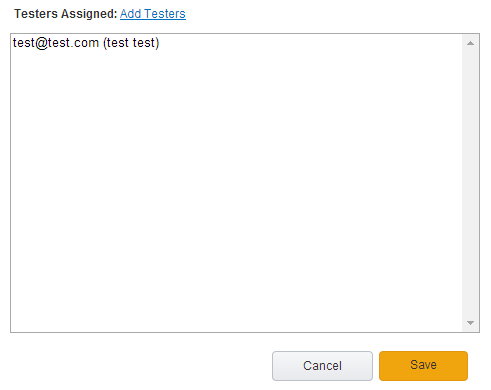 Creating a new test is easy through the Amazon Developer Portal, at no cost to you. Click here to get started. Click here to get a free Amazon developer account. Do you want your app or game to be on the new Fire phone? Most Android apps already work on Fire phone. 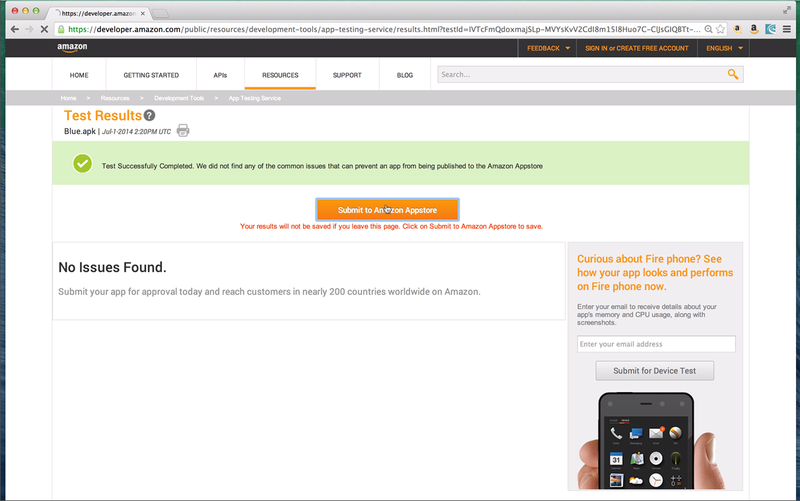 Take 90 seconds to find out if your app is ready by using the Amazon App Testing Service. If any incompatibilities are found while testing, you’ll get a detailed report with guidance on how to remedy the situation. 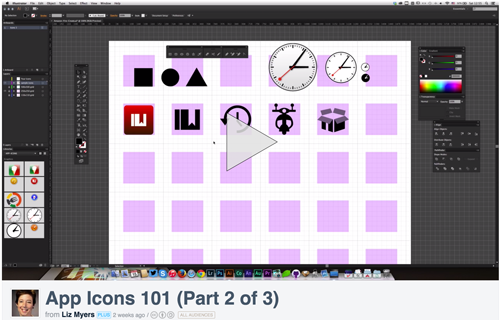 To help you get started, here’s a step-by-step guide and a video that walks you through the process. To start, head over to the developer portal at (https://developer.amazon.com/welcome). All you need is your app’s .APK. Most Android apps work on Fire mobile devices without change. If the tests do find anything that could prevent publication, you’ll receive specific suggestions and be directed to documentation that will help you make the necessary changes. You can also use the testing service to get several screenshots so you can see what your app looks like on Fire phone, as well as a log and information about CPU and memory usage. These tests take about 6 hours. If you’re signed into the developer portal, this will happen automatically and the results will be available on your App Testing service dashboard: https://developer.amazon.com/tya/dashboard.html. If you don’t have a developer account yet, just enter an email address and the results will be sent to you. The top section of the results page includes a list of screenshots. Click through them to see what your app looks like on the right. Below that are sections that show you memory and CPU usage and your log during the test. To submit, you’ll need to sign in. Developer accounts are free so go ahead and make one if you haven’t already. Amazon Developer Select: Optimize your apps for Fire phone and get enhanced merchandising and 500,000 Amazon Coins incentives for your customers. Get the details here. Amazon Mobile Ads API: Developers earn $6 for every thousand interstitial ads displayed across any supported device in August and September (up to one million impressions per app per month) when they distribute their apps on Fire phones and send the first ad request from a qualified app. Get the details here. 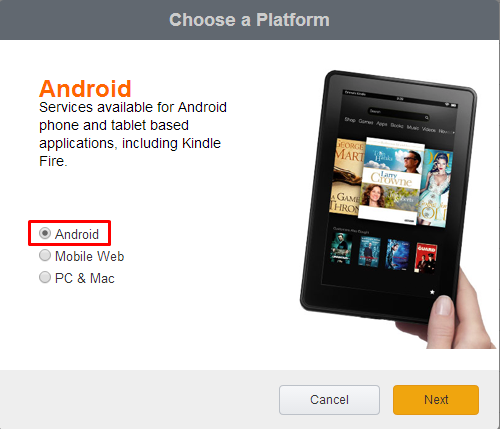 Amazon App Testing Service: Most Android apps just work on Amazon devices. Test your app's compatibility in 90 seconds by dragging and dropping your Android APK into our testing tool. Sign up for a free developer account to test your app's look and feel on devices and get the results within 6 hours. Test your app now. Now is the time to submit your apps and games! Apps that are submitted by July 18 and approved will be in the Amazon Appstore when Fire ships on July 25. Fire proactively brings your apps and content to customers with the enhanced home carousel. Fire’s home screen includes several capabilities to help customers do things quickly. Beyond fast and predictable navigation with the right and left panels and the app grid, the home carousel helps customers get right back into your app. In the screenshot to the left, the built in weather app is shown within the home carousel. Each app has the ability to show a list or grid of information and actions in the carousel widget. You can see this right below the weather app’s icon. Because it gives you nearly half the screen, an app can easily show three items on the screen and the customer can scroll to more. The Weather app has designed their widget to show the weather for the next three days. You can see the day, the temperature and a visual forecast. 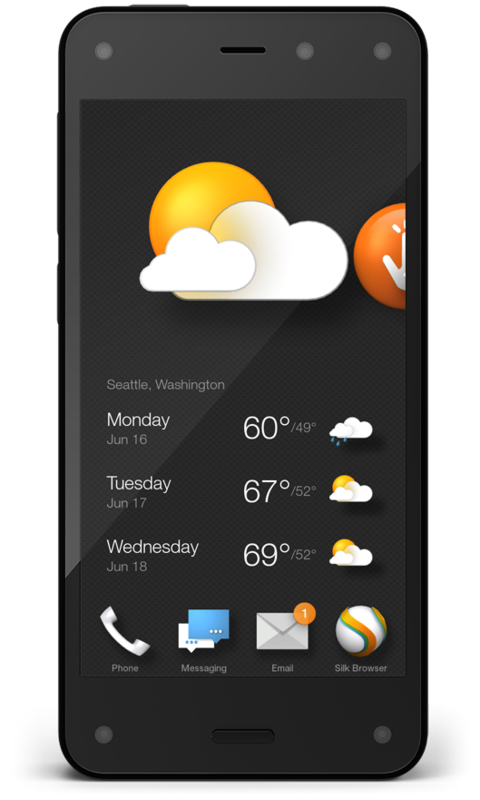 Tapping the Weather app widget triggers the action associated to it, which takes you straight to that day’s weather in the app. You can drive customer engagement for your app by designing a widget to have the information and actions that are most interesting to your customers. The carousel widget enables you to expose content related to your app without the customer needing to launch your app. You customize the user interface to keep customers informed even when they’re not in your app and then, give them easy access back into your app. Developers often track engagement metrics like 1-day, 7-day and 30-day retention and they work to increase the number of people that use their app day to day. Of course this starts with interesting content, but it’s also important to draw people back into the app using a devices services like Game Circle and Notifications . Now, with the release of Fire, there are two new ways to augment your app: Firefly and the Active Carousel Widget. The Active Carousel Widget contains a list or grid and you can also configure it to show more information when the customer uses peek. The examples below show how a widget might look as a simple list or with more detail like icons, descriptive text or star ratings. Beyond seeing information from your app, customers can also tap an item in the widget to launch your app. The widget communicates with your app through intents that you define. Your app manages all changes to the widget, including the information shown and the behavior it invokes. When the customer taps an item, they are taken directly to the right place in the app – it can start an activity, or broadcast the intent. 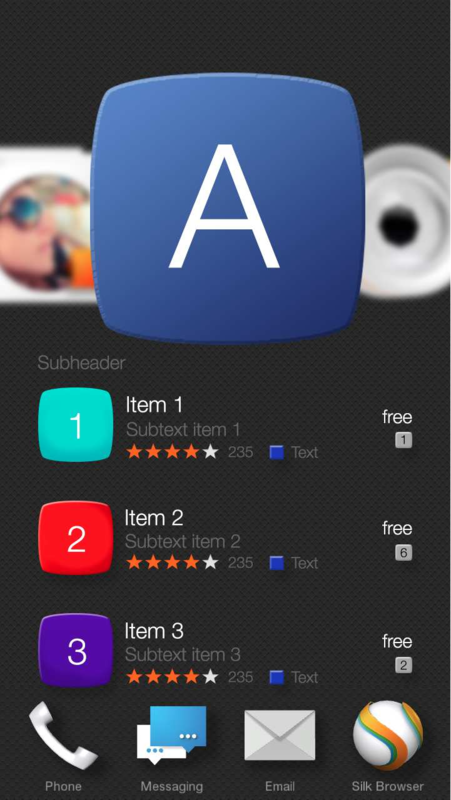 Your app can also display a numeric badge on your icon for things like unread messages, new deals or fresh content. So, with Fire, you have more ways to attract your customer’s attention and to engage with them. Zillow is a home and real estate marketplace helping customers find and share information for making home-related decisions and connecting with professionals. The Zillow widget shows an updated list of open houses in the area and up-to-date details on homes from a customer’s saved searches. This is a great example of bringing engaging information to the surface. When customers notice an interesting house, they can tap it and be taken right to it’s listing within the app so they can immediately learn more it. 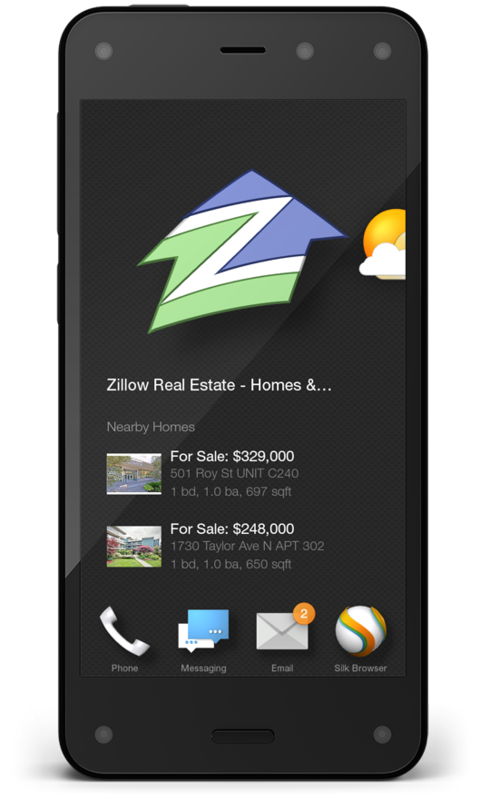 Zillow also integrated with Dynamic Perspective, the right and left panels and peek. StubHub allows fans to buy and sell event tickets. 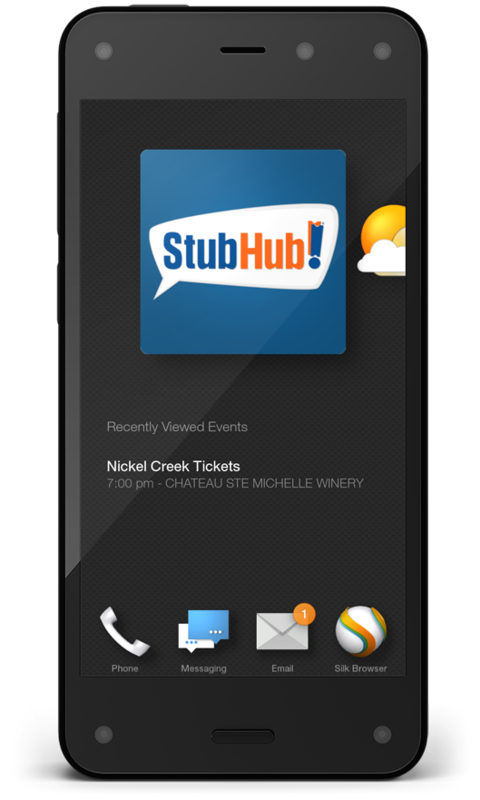 In StubHub’s widget, customers can see recently viewed and upcoming events. They can tap to see all the details. So, you can imagine a scenario where a customer was browsing upcoming shows but wasn’t really ready to make a purchase. With the design that StubHub chose, customers will be reminded of events and given the opportunity to get right back into the app to make a purchase. StubHub also extended Firefly so that they can connect people to events when they’re listening to music. If you’d like to learn more about Firefly and how StubHub integrated with it, you can read about them in the Firefly blog post. Terraria is an action-packed adventure game that recently came to Fire TV and Kindle Fire. They use the widget to give customers one tap access to their saved worlds. If you’re building a game, you may choose to do something like this or show leaderboard and achievements or even things such as which friends are on-line. 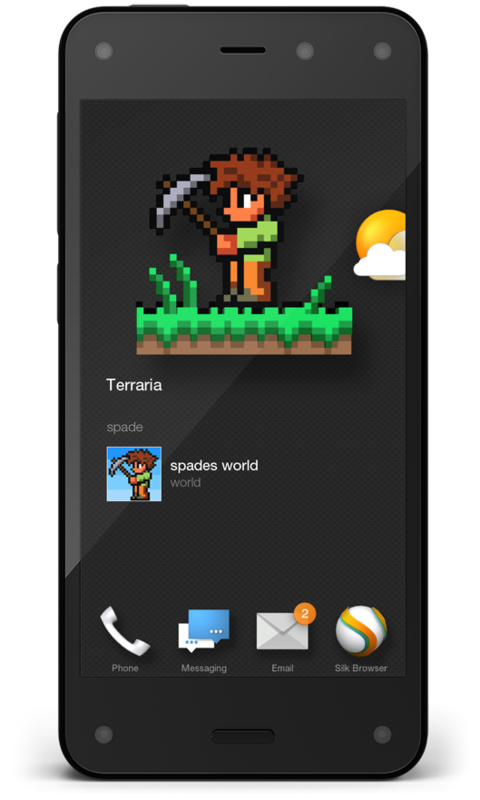 Terraria took full advantage of the new APIs in the phone. They support the Right and Left Panels to give customers one-handed shortcut access to their inventory. They used Dynamic Perspective to enable looking around the map and zooming just by moving closer or farther from the screen. The designs for each of the examples above are intentionally different. They’re tailored to that app and it’s customers. Because this is about how you can engage with your customers, it’s important to think through the scenarios that would interest and bring them back to your experience. For carousel widget development, you’ll be interacting with the HomeManager to create a widget, update a widget, react to taps, define the empty widget behavior and add numeric badges to your app icon. 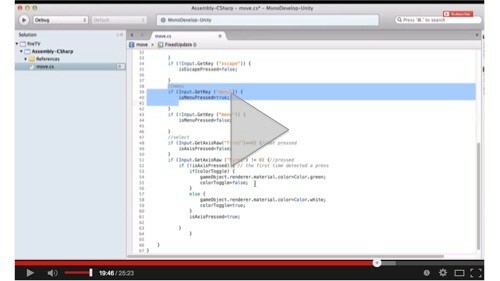 Here’s an overview of the code you’ll need to create a widget. Please see more detail in the SDK documentation. You can then update the content of your app widget at any time. If the widget is in focus when you update it, the new data appears immediately. Otherwise, the new data appears the next time the widget is created. If you are using a list display, you can add, update, or remove items from the list incrementally without forcing a refresh of the entire list. 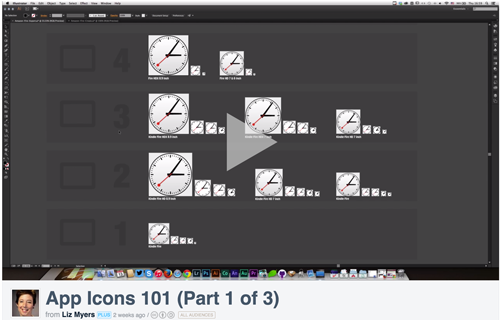 Incremental updates are animated. // Pass a value (int) to the HomeManager’s updateNumericBadge method. At the time you create an item you can define an intent that gets sent when that item is tapped. You can optionally include extra string data that identifies your item to give the receiving activity the ability to know which item was tapped. Use the item's setContentIntent(HeroWidgetIntent) method to set an intent. 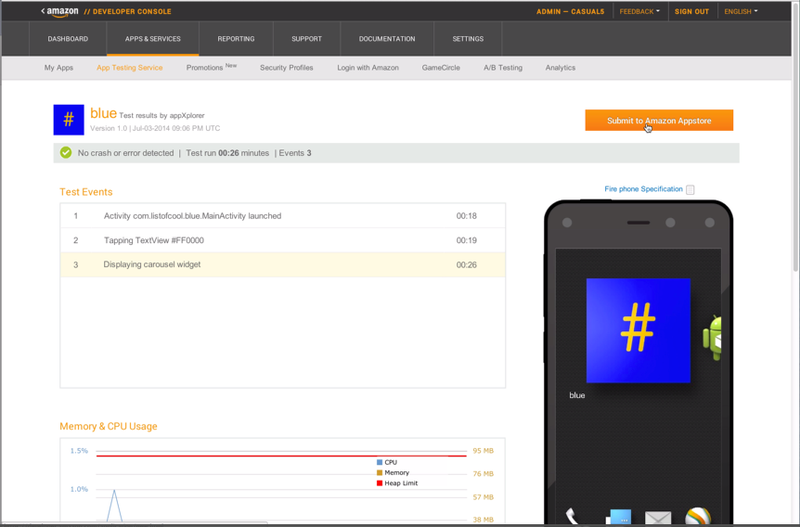 The Fire Phone SDK includes an API Simulator tool for developers who do not have access to a Fire phone. The API Simulator enables you to test basic app features, such as side panels and home carousel widgets using a regular Android device or emulator. The API Simulator Tool page explains, step by step, how to configure your app for use with the API Simulator and test your app's use of Peek, Tilt, panels and the home carousel widget on a stock Android device or emulator. Fire, the first smartphone designed by Amazon, introduces a new technology called Firefly which enables customers to quickly identify printed web and email addresses, phone numbers, QR and bar codes, plus over 100 million items, including movies, TV episodes, songs, and products. Customers simply press and hold the dedicated Firefly button to discover useful information and take action in seconds. With the Firefly SDK, developers can build apps that recognize real world objects—music, movies and more—and let customers interact with them. As a developer, you can create more immersive experiences that increase both engagement and the frequency of app use. The Firefly SDK comes with built-in recognizers and databases for products, music, movies, URLs, and websites, as well as built-in actions such as dialing a phone number, looking up an object on Amazon or going to a website. 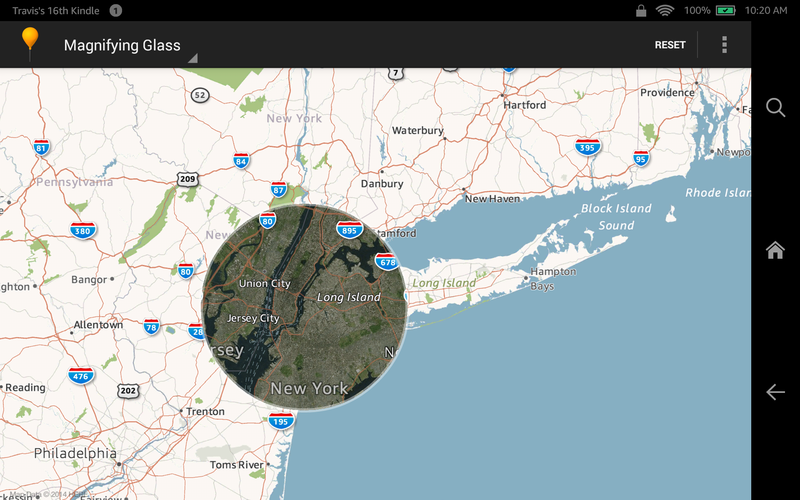 Developers can use the Firefly SDK to take advantage of the built-in recognizers, databases and actions. An important success metric for any app is engagement, a measure of how frequently and how long people use your app. You need to find ways to bring customers back day after day. Building a Firefly-enabled app is a new technique you can use to get customers to discover your app, sign up and then to come back frequently. A Firefly-enabled app delivers actionable options (for example, customers can buy concert tickets for a recognized artist) or supplemental item information (for example, the amount of calories in a drink). Customers then have fast and easy access back to your apps, services and brand when they’re actively engaged and interested. Here are a few examples of how iHeartRadio, StubHub and MyFitnessPal have made use of Firefly to give their apps greater exposure to both new and returning customers. All of these examples start when the customer activates Firefly. They do this by pushing and holding the Firefly button on the left side of Fire. Once an item is identified, a list of actions showing the Firefly-enabled apps is offered. iHeartRadio enables customers to listen to live radio stations, create their own artist or song-based custom station from a catalog of more than 19 million free songs, or tune in to thousands of shows and personalities on demand for free. 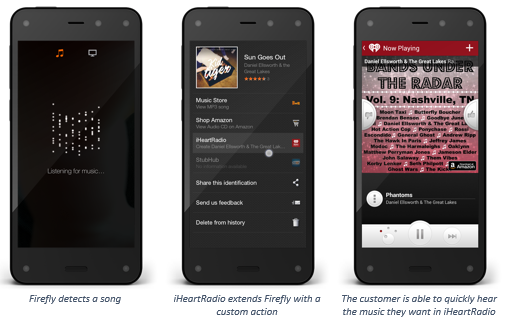 When paired with Firefly, the customer can identify a song with one button press and then directly launch iHeartRadio to create their own station based on that artist. This is a new way for customers to use the StubHub services. 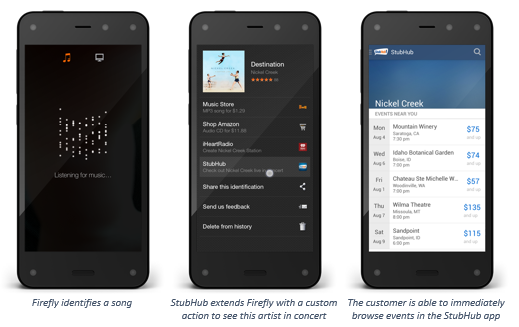 When they use Firefly to identify a song or an artist, they have direct access to the Firefly-enabled StubHub app and can be browsing upcoming events before the song is even over. MyFitnessPal is a free and easy health and fitness system that helps you attain fitness goals. 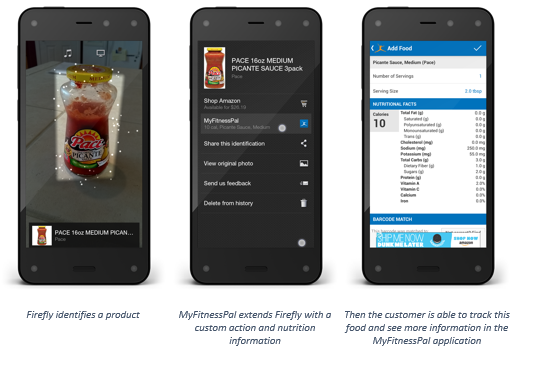 Using Firefly’s built-in product recognizers, the team at MyFitnessPal has added custom actions to give customers nutrition information and to help them easily track their daily calorie intake. When a customer scans a physical product, barcode or QR code for a food item, MyFitnessPal’s actions and extra information about that food are offered to the customer. They can then tap the item and go directly and add that food item to their diary in the MyFitnessPal app. In all of these examples, the app and its services were activated in the context of the customer’s activity. They didn’t need to open an app and navigate to the right screen. Instead, they were able to identify a song, product, barcode, QR code or movie soundtrack, and then launch directly into the app they wanted to use. Firefly-enabled apps have more options for bringing in new customers and then engaging with them more frequently. Better engagement leads to higher customer satisfaction and ultimately, to better revenue. 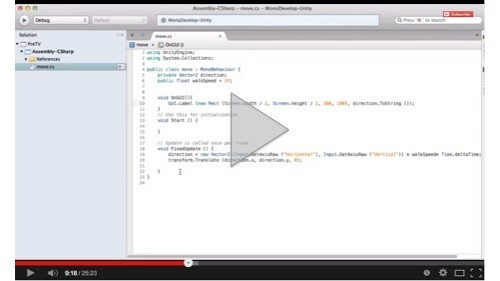 The SDK for Firefly includes the library, developer guides, docs and several samples to get you going.